There are literally thousands of small tools that help you free up disk space, tweak your startup items, shred files so they can't be recovered, and clean your registry. What if you could get them all packaged together in one program? That's what nCleaner promises to do with over 90 cleaning tools combined into one application. You can remove unnecessary files that programs like Internet Explorer, Skype, and Yahoo Messenger generate to reclaim more precious disk space and further shred them so they can't be recovered later. The all-purpose cleaner also lets you tweak Windows features, schedule cleaning operations, and optimize system memory usage. When you install it, nCleaner asks you to add a bunch of commands to your context menu. If you're sure that you'll be using it often, it might be a good idea to add them, but otherwise, you'll just be cluttering up your context menu. 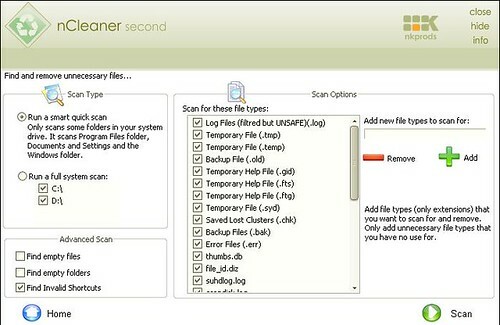 nCleaner is free for non-commercial use and works on Windows XP, 2003, and Vista.